For those of you out there that are Arai fans, you are well aware of the history the RX carries with it. In 1979, the original X-7 was created and later evolved to the well known RX-7, which is considered to be the helmet which changed the face of helmet design. The RX-Q is the ultimate street helmet. Aimed at the experience street rider, the RX-Q is optimized for the conditions, speeds and environment of the real world. Check out the RX-Q at Extrememoto. This post was originally posted here (WIRED) and here (Hell for Leather). Don’t forget we have a 4th of July sale going on which saves you 15% store-wide at Extrememoto when you use coupon code HAPPYFOURTHBLOWOUT. Offer ends 7/11/11. 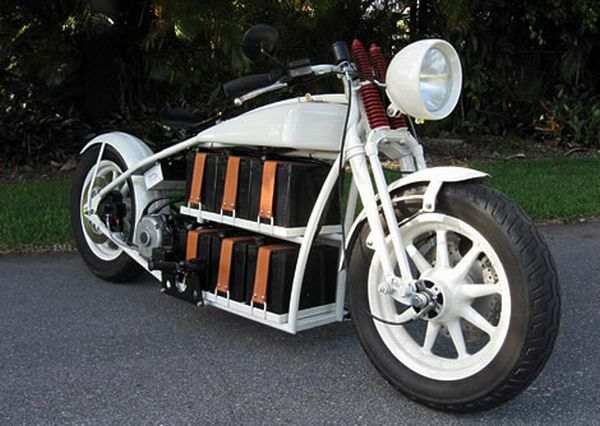 It’s no secret, we are fans of everything electric and when we find new electric motorcycle concepts, it excites us. Today’s feature offers a cool twist to the previous electric bikes we’ve written about. 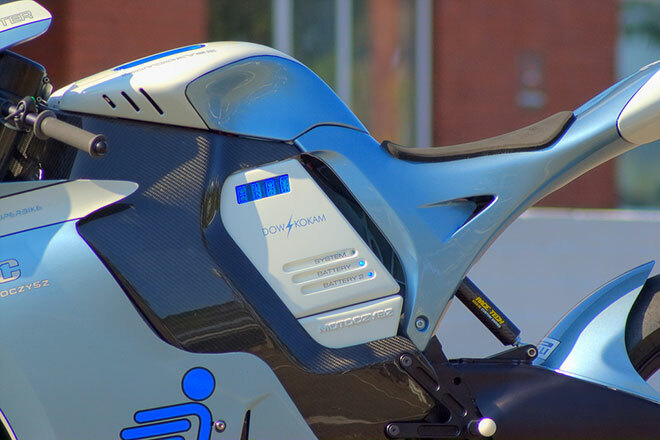 The Shavit electric superbike, created by Shenkar College engineering student Eyal Melnick as part of his graduation project, offers unique adjustable features we haven’t seen before. This bike is equipped with an adjustable mechanism, which allows the rider to alter their seating position, providing them with a higher element of control and comfort. The Shavit features a 180hp engine, weighs 374 pounds and has a wheel base of 1380mm. Thanks to EcoFriend for the great find! Trying to figure out if you should purchase motorcycle gloves? With a few styles out there, how do you know which is the right one for you? This depends on the riding conditions you experience. The most common gloves are full fingered gloves. Usually purchased for protection from those cold days, full fingered gloves with good ventilation can be worn in all types of weather. There are also open finger gloves which provide protection and better ventilation. Whatever the case may be, gloves are an absolute must when riding. Gloves allows you to have a better grip on the handle bar and also protect your hands from flying debris on the road. Even the smallest insect can sometimes feel like a rock hit your hand depending on your speed. In the event that you do fall, gloves will protect your hands from scrapping as well. This could be very painful and may even put your riding days on standby until you heal. Abrasion-resistant Armor-Link III mesh and perforated goatskin backhand and fingers with soft, stretch Lycra fourchettes. Durable, reinforced and perforated goatskin palm with EVA foam padding to reduce shock and vibration. Pre-curved fingers and palm for improved comfort and dexterity while reducing hand fatigue. Armor-Link III mesh and perforated goatskin cuffs with a secure hook and loop wrist closure. Protective EVA foam knuckle padding with articulated TPR finger armor. To show the public and politicians the number of motorcyclists there are on the road. To show that motorcyclists are from all occupations and from all walks of life. 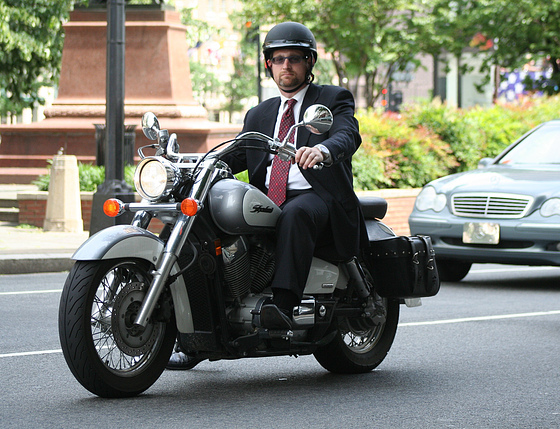 Motorcyclists can reduce the traffic and parking congestion in large cities. Motorcycles are for transportation and recreation as well. Motorcycling is a social good. 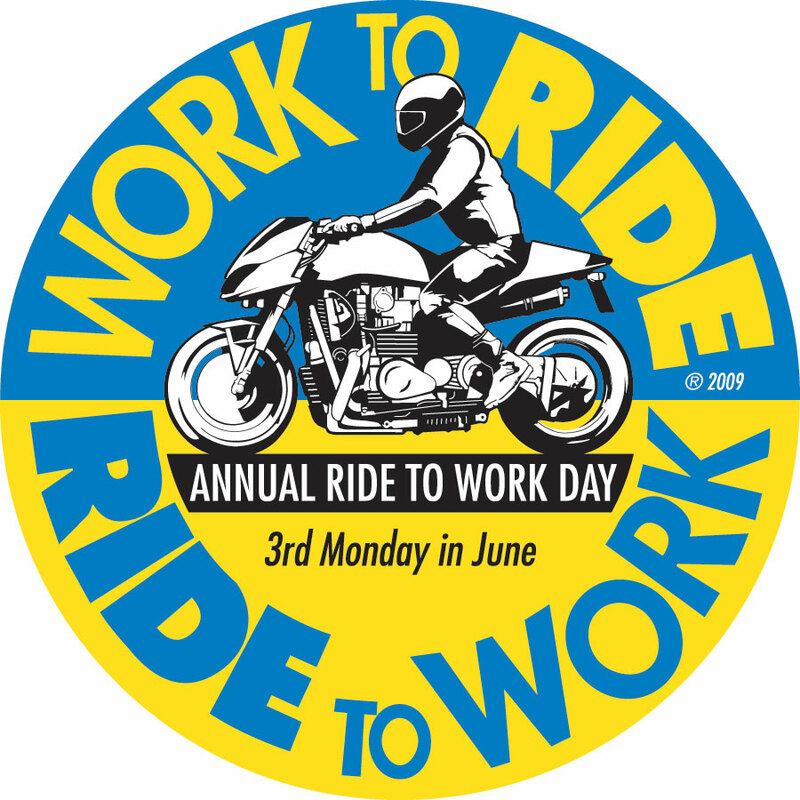 We would love to hear about your ride to work today. Post your comments below and feel free to post your pictures of you and your bike on our Facebook page. Looking good on his morning ride to work. Lately, we have received a lot of requests for motorcycle jacket recommendations. We are happy to see the development of a higher sense of urgency to wear a jacket by our readers. Jackets provide the rider with much needed protection of the back, ribs and internal organs of the area. They also provide much needed protection from the friction of the road when a rider falls of the bike. When made correctly, jackets can even protect bones from breaking on contact. 600 denier ballistic polyester shell. Reflective material panels for increased night time visibility. Waterproof, breathable rain guard barrier. Dedicated collar snap to prevent flapping when collar is open. Waterproof, zippered, three position shoulder vents. Pipeline ventilation system providing flow through ventilation. Two-way main zipper closure with dual wind flap. Wide reflective strips on the back and chest. Tourmaster’s signature reflective rear triangle. Microfiber lined collar and cuffs. Adjustable sleeve take up straps at the biceps and forearms securing elbow armor. Removable armor at the elbow and shoulder. Vertical zipper chest map pockets. Zippered hand pockets with flap closure. Dual zippered fanny pack and sleeve key pockets. Check out the available styles we have at Extrememoto. 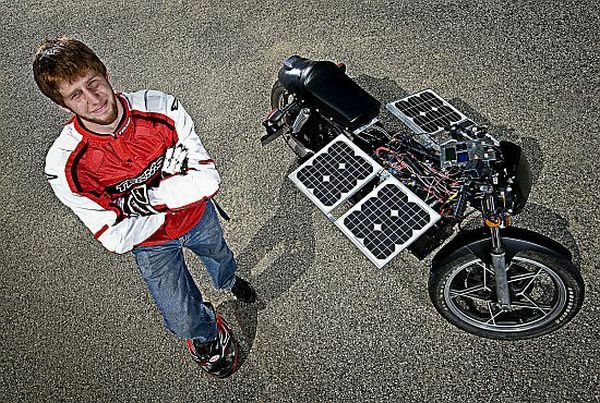 Purdue student makes $50 bike run on solar power. 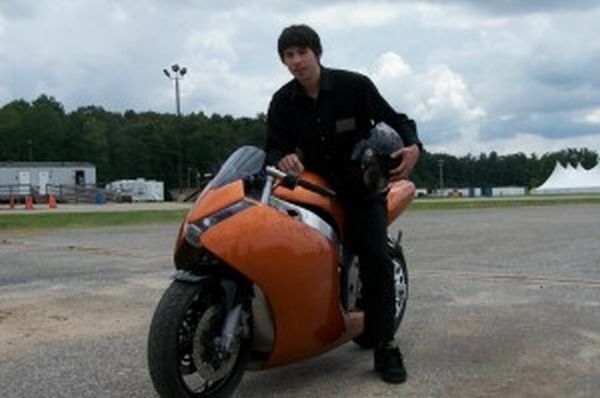 Tom Miceli's Kawasaki Ninja ZX6 electric bike conversion. 24 lithium batteries run this bad boy. 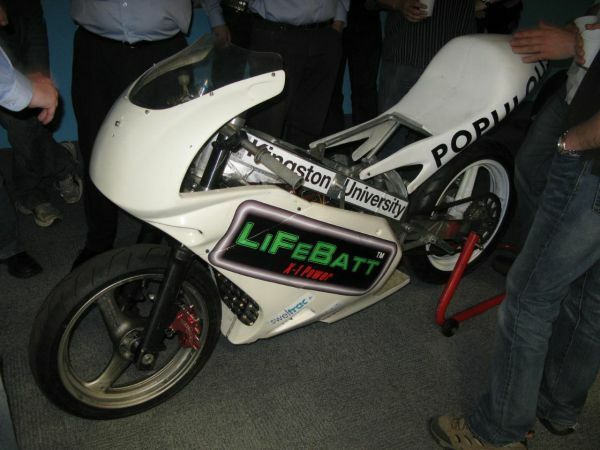 Kingston University's entry in 2009's TTX GP and was driven by Maria Costello. 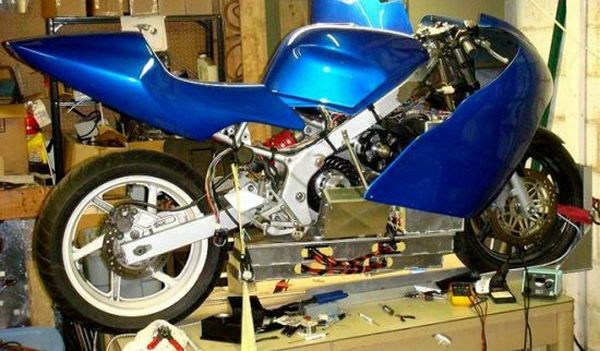 John Wild and Sean Ewing's electrically modified 1996 Honda CBR F3. Jeff Patterson's, ShocKing, powered by six 72 volt batteries. More information available at EcoFriend. Every week we receive thousands of fan emails asking questions about our gear. By far, helmets are the item the majority of you ask about the most. Lately, we have been receiving a lot of questions regarding helmets that offer great comfort and ventilation. You can really tell summer is here. Whenever comfort and ventilation come into question, there are two helmets which always top my list: The Shoei RF-1100 and the Shoei Multitec Modular. Both offer excellent doses of both. The Shoei Multitec Modular is the complete package for security, versatility and convenience. It allows riders to perform tasks that would normally require the removal of a full-face helmet since it can instantly convert to an open-face configuration. The aerodynamic shape also allows for very quiet riding while providing great ventilation. We are headquartered in Miami which means we deal with some very hot and moist weather most of the year. The Shoei Multitec Modular still keeps your head cool on our hottest days. Anastasia State Park – St. Augustine, Florida. 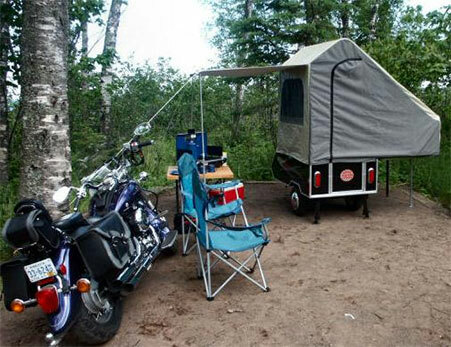 For more nation wide biker-friendly camping sites, visit BikerCamps. My kids want to trade their treehouse for this. 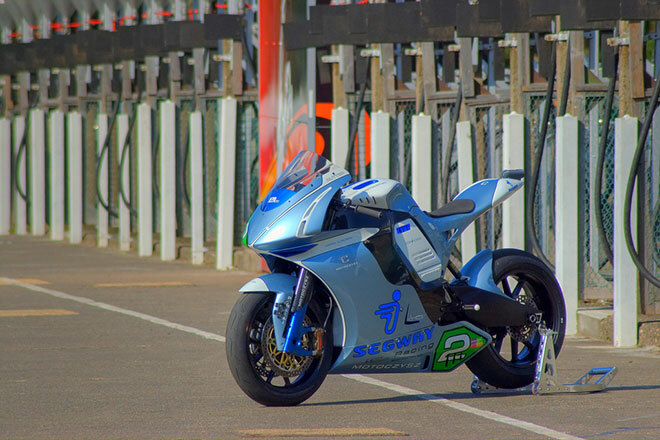 When the original MotoCzysz E1PC was released in 2010 for the TT Isle of Man, it was already considered to be the most advanced bike on Earth. Still incorporating a custom-built removable 12.5-kilowatt-hour lithium polymer battery pushing out 200 hp, the new model comes with added structural improvements. 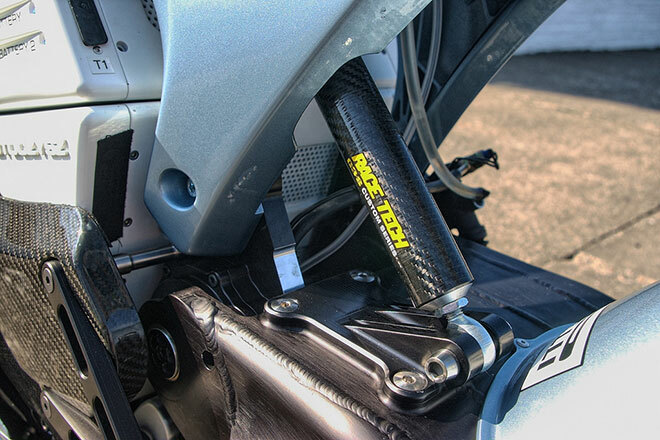 Lighter and sturdier carbon fiber frame which moves outward from the batteries. Weight reduction of 500 lbs. Relocation of suspension mechanism to the interior of the bike. Placement of shock absorbers beneath the tank for efficient space distribution. Expected increase in top speed over the 2010 model which maxed at 140 mph. 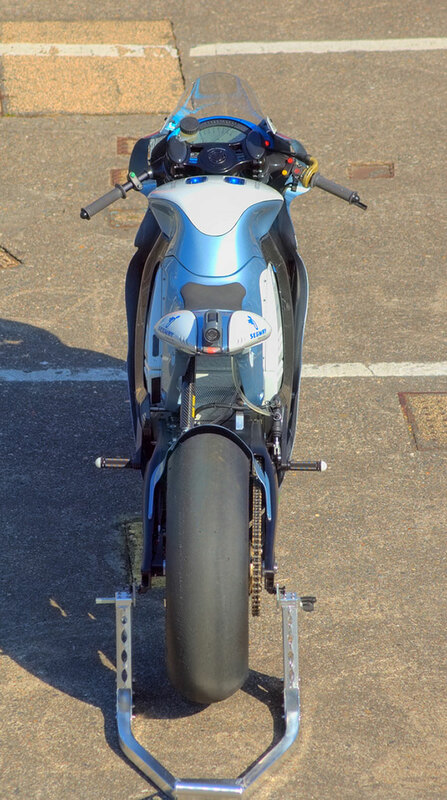 This bike will definitely be a fierce competitor in future TT Isle of Man competitions. It's got an eye on you. The idea of hover vehicles has been around forever. Every kid that saw Back to the Future II couldn’t wait for the hover board to make it to the local skate shop. Twenty six years later, we are still waiting for a “hover-anything” to be released. 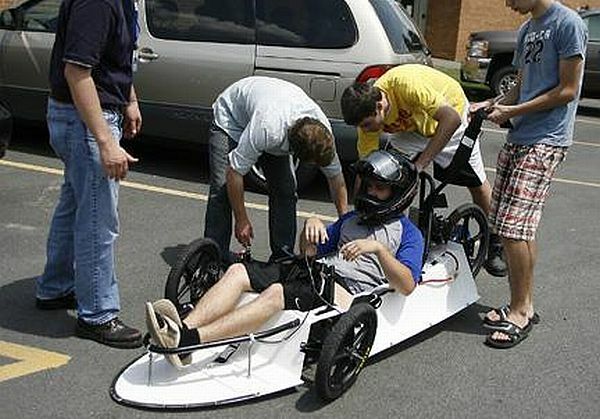 That is until Australian engineer Chris Malloy decided to take matters into his own hands and created the Hoverbike. 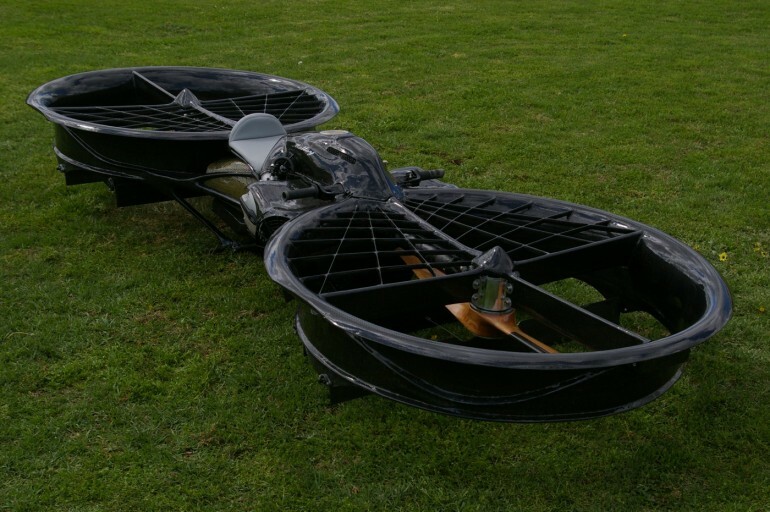 Made from a custom carbon fiber frame built by Malloy, the Hoverbike is equipped with a BMW Boxer-4 engine which has 107 horse power. 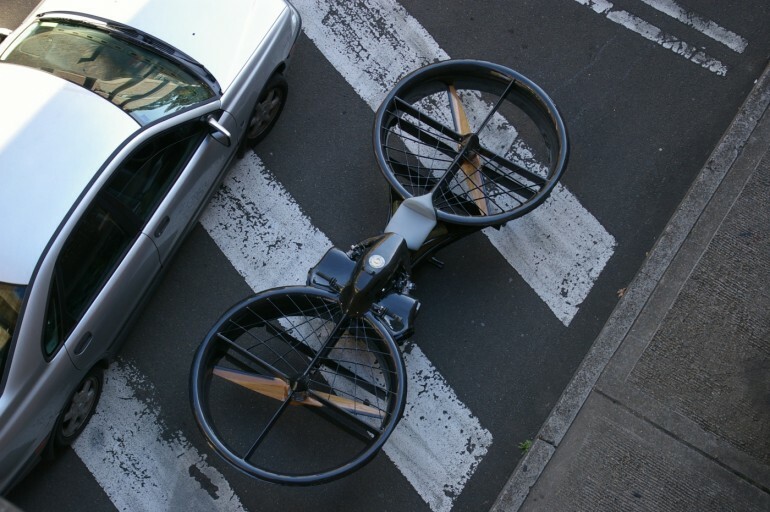 It also has wood rotors which counter-rotate, allowing the bike to stay level. Mallow has completed production of the base vehicle and has ran a few strap-down tests but needs funding to continue with the project. He estimates that a production version would cost about $40,000. 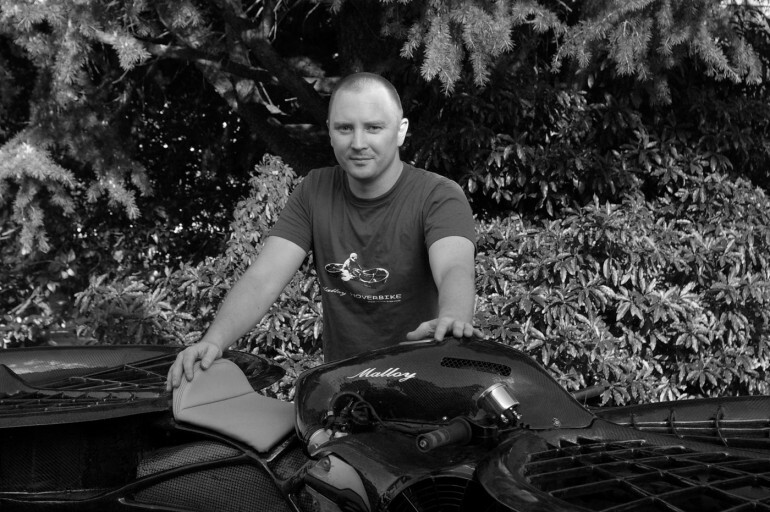 Malloy’s initial idea for the bike was that it could be used to monitor livestock in Australia’s enormous farmlands. Though we love this idea and it seems very practical, we have to agree with Jalopnik in that this is the opportunity for the “greatest spec racing series in the history of man”. 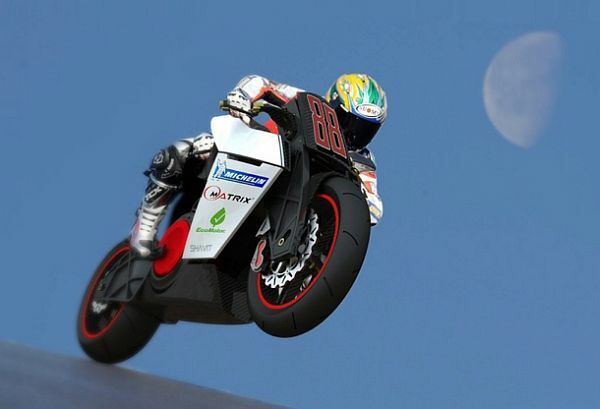 The Hoverbike has brought Star Wars racing to real life. Best Western is celebrating its 65th anniversary by holding a new contest for motorcyclists. 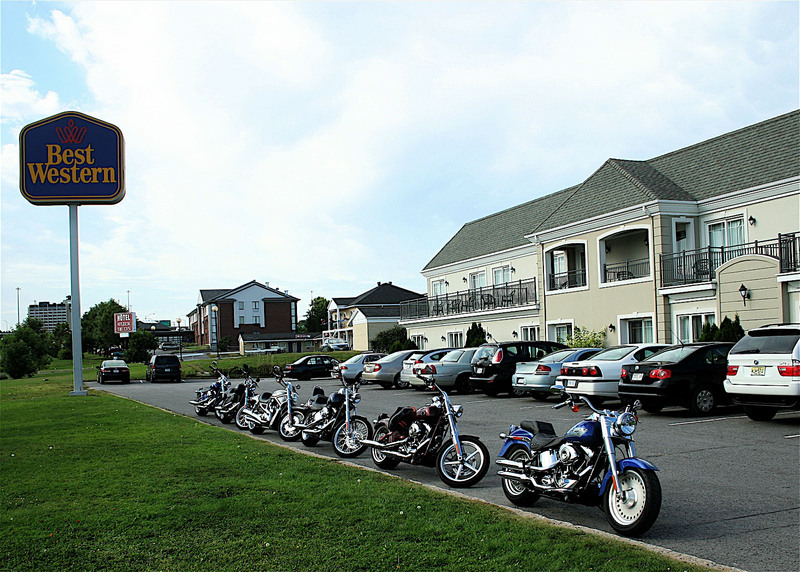 Riders must take photos of their motorcycles in front of any of the 2,000 North American locations and submit them to the Best Western Facebook page. Each week until July 15, three entrants will be randomly selected to receive 5,000 in Best Western reward points. These points can be used to redeem air miles, hotel stays, gifts cards and more. The first rider to submit a photo in front of a Best Western, Best Western Plus and Best Western Premier sign will win a $650 travel card good to any worldwide Best Western location. The grand prize winner will receive 65,000 reward points. We would love to see the pictures you take so feel free to post them on the Extrememoto Facebook page as well. Ride safely and good luck! When it comes to helmets, Shoei is a name we all know and trust. With such a diverse product line, we are trying to familiarize everyone with their different styles, one post at a time. 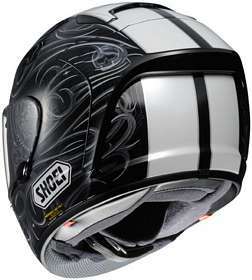 Today’s featured helmet is the Shoei X-12. The X-12 is a monster of a helmet though we find that it has many similarities to the RF-1100. It has the same CW-1 face shield as the RF-1100 providing the tight fit we love. The AIM+ shell comes in five sizes ranging from XS to XXL and it comes with the same 5-year warranty. One very beneficial addition on the X-12 is the emergency release system for the cheek pads. There are a pair of red tabs on the bottom of the helmet, between the liner and the shell. These tabs can be pulled to release the cheek pads, which make it easier to remove the helmet from an injured rider. The X-12 also features face shield locks, which normally are only found on race-oriented helmets. Along with the shield locks, the X-12 also comes equipped with Shoei’s “3D Max” liner system which is proven to absorb and dissipate sweat two-times faster than traditional nylon interiors. With the summer heat (it’s really all year round) we get here in Miami, this feature is a must. 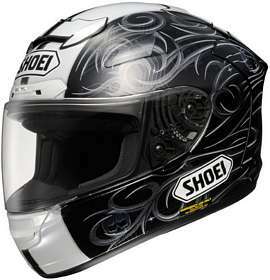 Shoei’s X-12 is also one of the first helmets to meet the new Snell 2010 safety standard. If you have any questions regarding the X-12 or any other item we carry at Extrememoto, feel free to email us at support@extrememoto.com, use the Live Chat feature on our website or contact us through Facebook or Twitter . We are always happy to chat with our fans or answer any questions you may have. Any X-12 owners out there? We would love to hear what you think about your helmet. Post your comments below.